Professionals use social networking to scout for talent and generate business leads. “About 10-20% of the lateral hires in the next few years could come from the social networks,” said Shivani Verma, HR expert. Companies are increasingly using LinkedIn as an integral part of their marketing mix. Several companies are asking for our guidance on building innovative marketing solutions for them, the company said. “LinkedIn can prove to be an excellent ally for professionals to market their expertise. It is becoming the professional’s identity of record,” said Dinesh Agarwal, chief executive officer, IndiaMART.com, a small enterprise that has a LinkedIn account. The company boasts of its strong sales marketing team and caters a huge advertiser base. 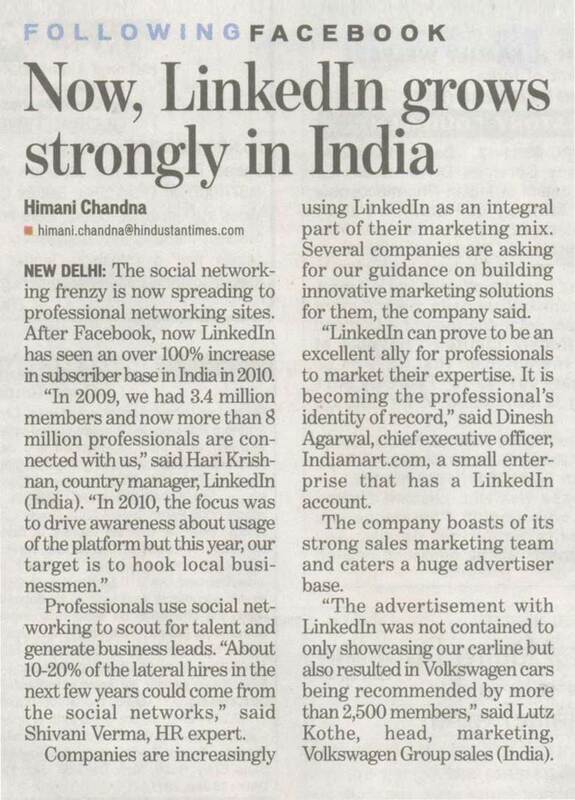 “The advertisement with LinkedIn was not contained to only showcasing our carline but also resulted in Volkswagen cars being recommended by more than 2,500 members,” said Lutz Kothe, head, marketing, Volkswagen Group sales (India).